Neuromodulators are muscle relaxants made from a natural protein. A very small needle is used to skillfully inject this protein, relaxing the tiny facial muscles that cause facial wrinkles. Neuromodulator treatments are especially helpful in reducing the appearance of frown lines, horizontal lines that cross the forehead, downturned lines around the mouth, and crow’s feet around the eyes. The results of your treatment appear gradually over the next 7 days, during which time you can confidently resume all of your normal social activities. The appearance of the results can range from softening of facial lines to full erasure of lines and wrinkles. A follow up appointment provides an opportunity for Dr. Hartt to check on the results, and administer any touch ups that may be desired. Results typically last 3-4 months and can be safely repeated with results often improving over time. Neuromodulators have been safely used for decades, however they are not recommended if you are pregnant. Hyaluronic acid fillers are a popular choice for medical cosmetic treatments as they provide uplifting results without surgery. These injectable gels are an effective solution for sagging skin as they restore the facial volume that often depletes with age. Fillers replenish the natural contours of your face and define its unique structure to give it a natural and youthful appearance without incisions or scarring. Some clients may experience slight discomfort during treatment, but most find the injections to be painless when a local anaesthetic is used. Hyaluronic acid fillers are a family of products comprised of the same sugar compounds found in human skin cells. This minimizes any reaction to the product as it gradually reabsorbs into your body’s tissues. The results typically last 12-24 months (treatments to the lips typically last 4-6 months) and you can safely repeat the procedure if you desire. These cosmetic medical treatments are not just for women. Men can experience the same satisfaction and results, and enjoy the improved sense of self that comes with feeling attractive and confident. Sculptra is a unique filler that progressively restores lost collagen. The results are gradual and subtle, often taking several weeks to evolve. The final result is a fuller, smoother, younger and natural-looking face with less pronounced lines, creases, wrinkles and folds. Results are longer lasting than hyaluronic acid fillers, typically 2+ years. On average, 3 to 5 injection sessions are needed over a period of a few months. Each session builds on the last to produce a natural-looking appearance that doesn’t look like you’ve had work done. The injected material, called poly-L-lactic has been used by doctors for many years in dissolving stitches and is naturally absorbed by the body over time. Bellafill is a permanent filler that is injected just like temporary fillers and provides an instant result. Its uniform 30 to 50 micron polymethyl methacrylate (PMMA) microspheres are suspended within a base of smooth collagen gel. Once injected, it immediately adds volume below wrinkles or atrophic acne scars to lift them to the level of surrounding skin. As the body metabolizes the smooth collagen gel, it leaves behind the PMMA microspheres that form a scaffold to support the production of endogenous collagen to maintain volume and natural looking results long term. Bellafill is permanent, it can be removed only by surgery, therefore a skilled and experienced injector is crucial. Dr. Marcia Hartt is very conservative when injecting this product and does not inject into areas of the face that are risky. Yes, these treatments have been available for over 20 years and millions of people have had successful results. Because the product does not remain in your body, there are no cumulative effects to be concerned about. There are so many facial lotions that claim to reduce wrinkles. Why do neuromodulators have to be injected? Topical creams can moisturize the surface layers of the skin but don’t affect the muscles under the skin. The protein molecules in neuromodulators are too large to pass through the skin to the muscles below. The advanced injection techniques allow the proteins to be introduced to the exact location where they will have the best results. I heard that neuromodulator treatments can give me Botulism. Is that true? No, there is no risk of contracting Botulism from these treatments. That is a condition associated with food contamination and can be developed if you ingested contaminated food. Responses to doses can vary from person to person but 3-4 months is usually how long it takes for the results to wear off. Will my face look fake or lack expression after treatment? When treatments are professionally administered, the result of the treatment is a more rested expression, not a frozen expression. This is why physicians with an artistic eye are the only ones truly qualified to do these treatments. Are there any signs after treatment that I should watch for? After you receive the injection at our Edmonton clinic it takes 5-10 minutes for the proteins to be absorbed into the targeted muscle area. This will appear as small bumps under your skin which will disappear. Over the next few days you’ll notice the muscles becoming more relaxed. The full benefit can be seen in 7 days just prior to your follow up appointment. If you have any concerns with your results, they can be addressed at that time with touch up treatment. What kind of cosmetic fillers does Dr. Hartt use? Collagen used to be the only choice for cosmetic fillers, however in the past decade, there have been several new options both permanent and temporary that help to reduce the appearance of acne scars, replace lost facial volume and enhance the lips. Dr. Hartt prefers the use of hyaluronic acid fillers which provide long lasting results, are unlikely to cause allergic reactions, and can be reversed if required. These products are sugar gels and reabsorb into the skin. Dr. Hartt also uses Sculptra in certain clients. The results with Sculptra are gradual, subtle and longer lasting than hyaluronic acid fillers. How long will the effects of the filler last? You can expect hyaluronic acid filler results to last between 12 and 24 months depending on how quickly the filler is reabsorbed by the surrounding tissue. You can expect results in the lip area to last 4-6 months, due to the movement that occurs in this facial area. Sculptra typically lasts 2+ years. What areas of the face can be treated with fillers? The key areas that fillers are helpful for restoring volume include the brows, the hollow areas under the eye, cheeks, the groove from the nose to the mouth, along the jaw line, and shadows under the mouth that can pull your smile downward. Although it’s easy to refer to these general areas as target areas, Dr. Hartt prefers to look at your face as a whole, and will make recommendations on the best options for you, based on your desired outcome. 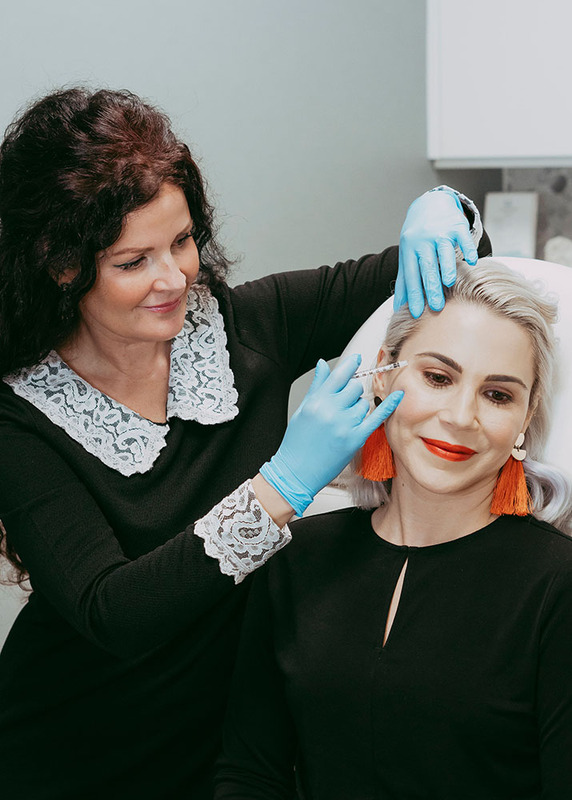 In order to avoid discomfort and minimize bruising, Dr. Hartt uses a short acting anesthesia prior to filler treatments at her Edmonton clinic. Your feeling in your face should return to normal within a few hours. If you’ve had treatments before and found them painful, you may be surprised at the difference Dr. Hartt’s advanced injection techniques can make. Are there any activities I need to avoid following my treatment? There may be some slight bruising and swelling around the treatment area for a few days. This is because the product will attract water, which is a desired effect in order to replace the volume that’s missing. You should be able to resume normal activities immediately. In most cases swelling resolves in 48 hours. What if I don’t like the results? Do I have to wait 12-24 months for the injection to wear off? No. Sugar fillers like Restylane® are reversible. This process removes the product within 24 hours. If you’ve had prior treatments from another practitioner using Restylane®, Perlane®, or Juvederm® products, Dr. Hartt can apply reversal medication for you. Don’t despair; you can trust Dr. Hartt’s artistic eye and impressive expertise.